The PPS electric submersible pump monitoring system can measure pressure, temperature, pump motor operating parameters, and vibration on the x, y and z axes. One of the key advantages of the PPS system is the high level of accuracy and resolution provided for all measurements. A gauge is placed underneath the ESP motor in line with the completion string and can measure all or some of the following parameters depending on the gauge chosen; intake pressure and temperature, discharge pressure, motor y-point voltage, current leakage, motor winding/oil temperature and vibration (x, y, z). The discharge pressure is routed through a pressure tube. 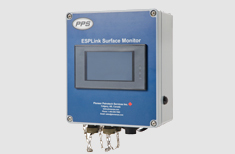 Using ESPLink operators can monitor intake and discharge pressure, as well as set parameters for the minimum and normal dynamic fluid level, and the critical and normal motor temperature.